This week’s photo challenge subject “green” took a bit of thought. Over the years I have been pretty involved with the green scene here in Atlanta so my first thought was something environmental. Over the weekend we went to the ‘barn’ in Chastain Park and the boys picked a huge watermelon. We haven’t cracked it open yet so it was luring in my mind as an idea. As a kid growing up in Macon, GA, each summer, maybe 4th of July or some holiday we would go to the swimming pool at Idle Hour Country Club. They would have all kinds of games throughout the day, but one of the fun ones was the greasy watermelon. They would grease them up, throw’em in the pool and the kids would wrestle over them and the first one to hoist it out of the pool won. When I told Martha I was going to grease up the watermelon, you can imagine the look on her face. I laid down some dark brown carpet pieces inside my light box to create a dark background and opened up the aperture to f4.5 which is as far as the Tamron 10-24mm will go. I did this to fade out the carpet as much as I could to blur the detail. 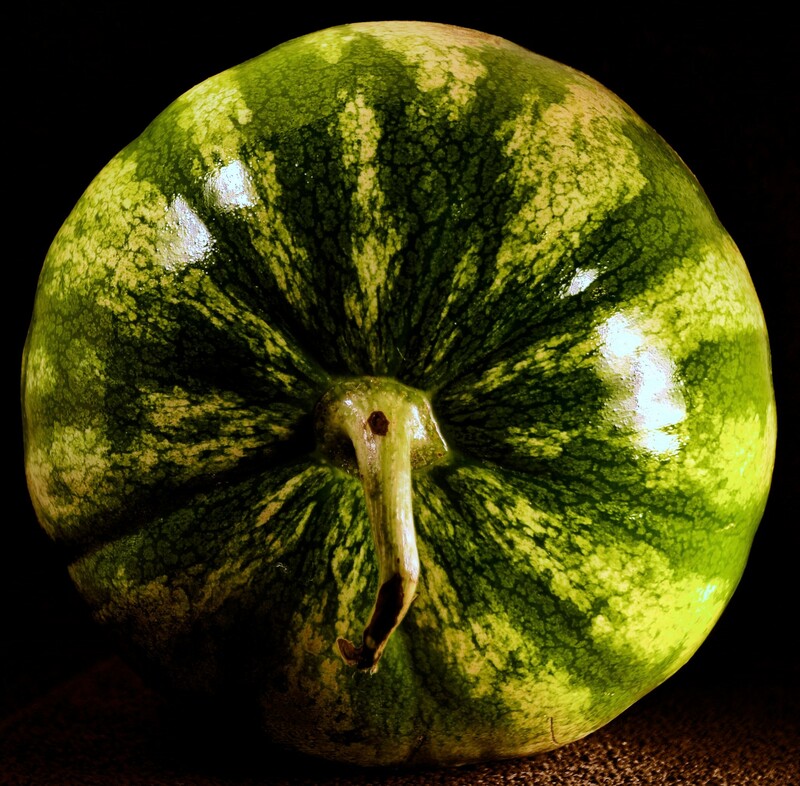 Once I had my positioning right, I used mineral oil to bring out the rich green colors of the watermelon. For lighting I just had two lights shining in, one from the top left and one from the right about centered. My camera was in aperture priority mode and I used the auto-bracketing feature to get three quick shots. I processed the photos using SNS-HDR Pro and after some tweaking, this is what came out the other side. I was pretty pleased with the outcome. Shutter Speed – 1/200 sec.